In one of my recent Yoga Teacher Training classes, we were discussing the differences between Hatha and Vinyasa styles of yoga. Coming from a background of education and practice in both styles, I incorporate methods from each practice into my class and personal sequencing. My Western students seem to be most familiar with vinyasa styles of yoga, generally giving it the upper hand as the more dynamic, and intense style of yoga. 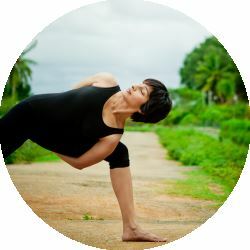 While vinyasa or flow yoga has a “cooler” image (thanks to years of effective marketing and a lack of proper understanding on the true concepts of both hatha and vinyasa styles of yoga), it should not go unnoticed that to balance your practice with hatha styles will bring greater benefits, staying true and authentic to the lifelong practice of yoga. From my observation, hatha yoga has claimed the image of being gentle, slow, or perhaps even boring. It is due to the lopsided import of yoga practice from the East, that the true meaning and value of Hatha yoga has been lost. Through this post, I would like to shed some light on what the two traditionally mean and how a well rounded and balanced yoga practitioner benefits most from the use of both – movement and stillness. First, I would like to clarify that hatha style yoga is not limited to a “gentle” practice. The word hatha actually means willful or forceful – and refers to a set of postures that are designed to align the skin, the muscles, and the bones. They are designed to open the many channels of the body – specifically the spine (referring to the sushsumna nadi) so that energy can flow more freely through the body. While the practice of hatha yoga is slower paced, it is by no means a gentle practice. Compared to subtler practices that were in use at the time (which may have been as early as the 12th century), the physical practices of hatha must have seemed forceful and hence, maybe the name. Hatha is also broken down as ‘ha’ meaning ‘sun’ and ‘tha’ meaning ‘moon’. This refers to the balance of the masculine – sun, hot, active – and the feminine – moon, cool, receptive – within all of us. Hatha yoga is a path toward creating balance and uniting opposites. In our physical bodies we develop a balance of strength and flexibility – something that is much needed with our current day lifestyles. We also learn to balance our effort and surrender in each pose. Hatha yoga is a powerful tool for self-transformation. It asks us to bring our attention to our breath, which helps us to still the fluctuations of the mind, and be more present in the unfolding of each moment. According to legend, Shiva is credited with propounding hatha yoga. It is said that on a lonely island, assuming nobody else would hear him, he gave the knowledge of hatha yoga to Parvati, but a fish heard the entire discourse, remaining still throughout. The fish (matsya) later became a siddha (wiseman) and came to be known as Matsyendranath. Matsyendranath taught hatha yoga to his disciple Gorakshanath and to a limbless man, Chaurangi. Hatha Yoga Pradipika mentions many other famous hatha yogis. Hatha yoga was thus passed down in disciplic succession (guru-shisya parampara). However, in the last fifty years, with the revival of yoga in the West, it seems that the real aim of hatha yoga has been overlooked or maybe even completely forgotten. Today, yoga is generally practiced to improve or restore health, to reduce stress, to age the body gracefully, and/or to build up the body and beautify it. Hatha yoga does fulfil these objectives, but it should be kept in mind that they are certainly not the goal, but rather a result of the practice. As one practices hatha yoga techniques, one’s physical and mental potential begins to increase and unfold – and the real goal of yoga to discover and experience the universal spirit within comes to surface. Vinyasa means “flow“, movement or position. Vinyasa yoga has become an extremely popular style of yoga as of late. This style of yoga not only makes one very strong and flexible, but also improves muscle tone, confidence and boosts self image. It is a dynamic practice and has exploded all over the world in the past 60 years. Vinyasa yoga had very humble beginnings. Sri. T Krishnamacharya, the father of modern yoga learnt the ancient art of Vinyasa from his teacher, Sri Ramamohan Brahmachari, one of the few remaining teachers of Hatha yoga back then. Krishnamacharya spent 7 years in Mount Kailash, Himalayas in a cave studying the ancient art and science of Yoga. On his return, he was employed by the Mysore king, Krishnaraja Wodeyar III, to teach yoga to the sepoy boys as well as the Mysore royalty. This is where modern day Vinyasa originated from. Krishnamacharya developed an intense routine to train the sepoy boys to keep them out of trouble while he taught more gentle practices to the royal family members. Many years later his disciple, Sri. Pattabhi Jois, popularized this style that is now labelled ashtanga vinyasa yoga. Ashtanga Vinyasa yoga is a sequence of poses that are combined with breath co-ordination. Over time, people who did not want to stick to the conventional method of ashtanga vinyasa broke off and created a freer, creative Vinyasa style. This lead to birth of multiple Vinyasa styles, schools, and types that we see in the modern world today. Vinyasa does not always mean the repetition of chaturanga dandasana combined with upward and downward dog. It simply means the art of sequencing yoga poses in a way where one flows effortlessly into another. Think of it as choreography. While vinyasa is a great practice, one needs to build up to it with care and proper alignment, as being reckless could lead to some injuries in this intense practice. Vinyasa has appealed strongly to the body-image obsessed western world, but wise yoga teachers who have spent a lifetime learning this art, understanding its ‘true’ meaning, will tell you how and when one needs movement and when one needs stillness. Should You Do Hatha or Vinyasa Yoga? The two styles are two sides of the same coin. Use of both practices should result in a well-rounded student. A teacher should have a good foundation of hatha and vinyasa yoga with the knowledge of when to practice each. Our bodies are constantly evolving due to external as well as internal factors, and we cannot (and should not) have the same practice every single day. We age continuously, events bring change, and yoga by no means is a one size fits all approach. The proper knowledge of hatha and Vinyasa will help keep a lifelong practice of yoga balanced and fully beneficial. As a teacher and practitioner, I strongly urge you to explore and understand how both styles are equally important to us. We must remind ourselves that all these divisions and sub-categories of practice are newer creations of the modern yoga world. Understand the subtleties of both approaches will make you a better student and teacher of yoga.